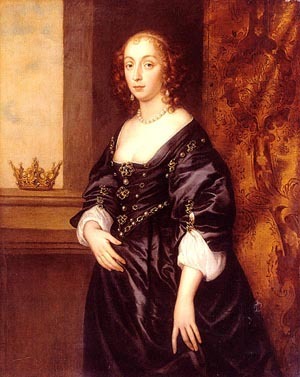 "Lady Mary ... was known not only for her beauty but for her wit, and recent research has established that she was very probably the anonymous poetess at King Charles II's court who published as 'Ephelia' .... This argument would suggest that Lady Mary Villiers was the most highly-placed, publishing woman writer of the Stuart period ...."
The above image of Her Grace, Mary Villiers Stuart, Duchess of Richmond & Lennox, with ducal coronet, is "perhaps a Van Dyck Studio copy" (Catalogue No. 25.21), Huntington Library Art Collections; a full-length version, also with ducal coronet and possibly by "a follower of Van Dyck", is at Petworth House, Sussex, whose portraits catalogue now includes useful amendments and information associated with the painting and its subject, owing to the recent attentions (December 2007/early 2008) of Alastair F W Laing, National Trust UK. See the author's new 'Ephelia' edition (Ashgate, 2003) for other commentary, with B&W image of the Huntington portrait. With gracious permission, December, 2003, of the Huntington Art Collections, San Marino, California.